Carla Valentino developed a severe neurological pain condition, CRPS (also called RSD), after spraining her ankle. 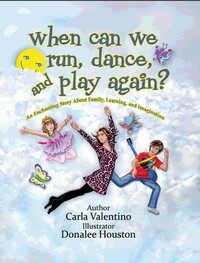 When her young daughter asked Carla when they’d be able to play again, this book was born. It’s a lovely, gentle, positive story. It normalizes a family’s experience with illness. It specifically states that it’s not the child’s fault. It lets children know that their family member is trying to get better, and wants to play with them again. It suggests other ways for a family to be close and have fun, even with illness. I would strongly recommend this book as a way of starting a dialogue with young children when there’s an illness in a family. An added bonus is that 20% of the proceeds from the book go to support CRPS research.